People on the autism spectrum can face challenges in dealing with a world they perceive differently to other people, no matter the severity of their condition. Some people with autism gravitate towards technology for learning, play and communication. For many, technology in the form of augmented communication aids has helped to give them a voice. We focus on the role technology plays in the lives of autistic people and their families. In particular, what are the benefits and problems, and where can we head in the future to get things right? As part of that ongoing work, we collected user feedback by pulling data from millions of autism-related comments in public reviews of apps. We found many of the comments showed there were some clear benefits to people with autism, but there were also problems that could have been easily avoided. Carly Fleischmann was once considered a non-verbal, low-functioning autistic person. Now, with the aid of a digitally synthesised voice, she interviews celebrities such as Channing Tatum and has her own online talk show. But there is little evidence of the long-term benefits and complications of using computers and mobile devices to assist, educate and entertain autistic learners. This is despite positive responses to computer-based therapy first being published more than four decades ago. In part, a dearth of evidence is due to research being expensive and impeded by ethical issues when working with people who are considered vulnerable. Moreover, many families are becoming increasingly disillusioned with autism research. Many feel that research outcomes have become distanced from practical strategies that help families manage the challenges that come with autism. This is important, because 1 in 100 children is being diagnosed on the autistic spectrum. Of the participants on the National Disability Insurance Scheme 29% are autistic, the second-largest disability group in the scheme. From an economic perspective, there is an increasing annual cost estimated to be A$5.8 billion that is borne by families, communities and government. If technology can help people on the autism spectrum then we need to get it right to help with their learning and communication, and to help their families and carers. Before we look to the future it is prudent to understand the present role of app-based technology. We scoured the Android Play and Apple App stores using a webcrawler that scanned as many apps and their associated reviews as could be found. The webcrawler applied an algorithm that kept reviews related to autism and discarded those that weren’t relevant, for example when autism was used as a derogatory term. From the extracted reviews, more than 85% referred to an app that was neither designed nor advertised for autistic people. We only found 57 apps specifically designed for autistic people that claimed to be evidence-based, but this was not verified. The first question we looked at was: what were the main reported benefits? Common problems in autism include language, education, behaviour, imagination, sleep, motor skills, attention, sensory, social, diary, hygiene, emotions, food and eye contact. So we counted how many times these themes appeared in the reviews. We found that language and education had the highest frequency of matches. 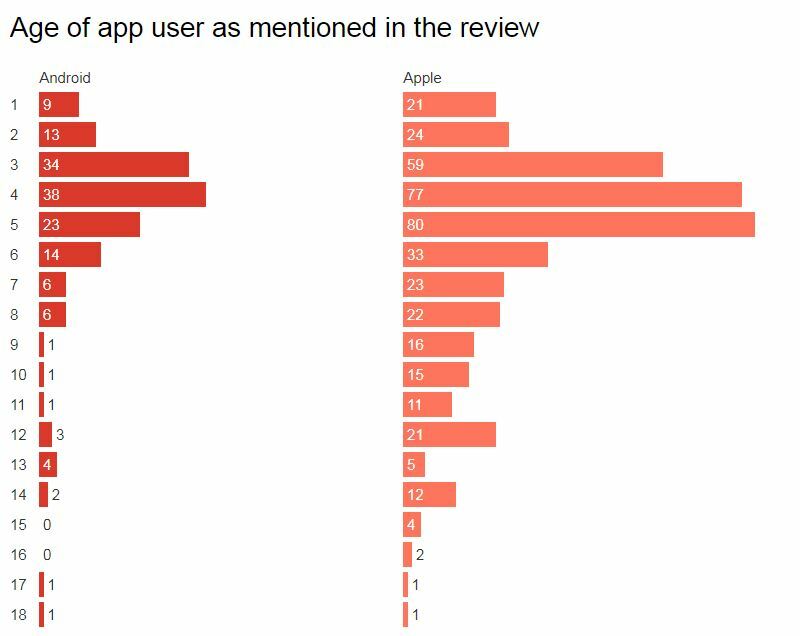 Apple reviews were more prolific and reported benefits in all areas examined, whereas Android returned a smaller number of reviews across fewer areas. Although anecdotal, this does give some credence that autistic people and their families are using technology for other than entertainment. 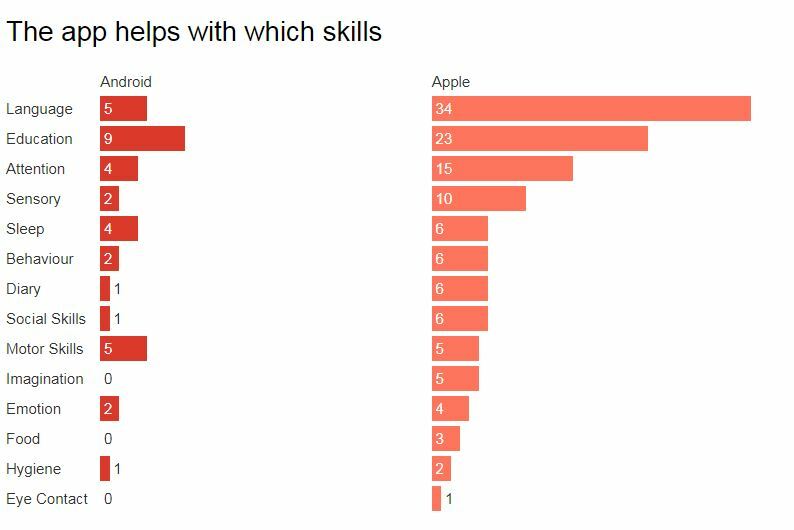 Age consistency was apparent between reviews from the Apple and Android stores, with the largest age groups targeted being between three and five year-olds. The reported ages ranged from one to 18, as shown in the figure below. The average age of autism diagnosis is typically about three years old and therapy usually starts as soon as possible. It is not surprising that there is a demand for technology suitable for an age group that coincides with the commencement of intensive interventions. Are app developers autism friendly? As we said earlier, the majority of the apps we found being used by people were not specifically developed for people with autism. But had these apps been developed with help from people involved with autism research, then the developers could be better advised on how to avoid causing any distress. Perhaps we need a set of guidelines for all software developers to help them develop autism friendly apps? Autism diagnoses are increasing and showing no signs of curtailing, and the causes are still debated. Research shows people on the autism spectrum tend to spend significantly more screen time than the typical person. As such, they have the potential to rapidly develop skills and learning experiences from technology. The use of any mobile technology must provide a positive role for people with autism. But there are still some serious unanswered questions as to how best technology should be designed and developed to mitigate overuse, or harm from poor design or deployment. Are the skills and experiences that are obtained from using a particular app being transferred to the real world? Are people with autism becoming dependent on the virtual world while elements of interpersonal interaction are sacrificed? What are the negative effects of overuse and poor design of apps? We believe technologies that offer safe, interactive and therapeutic environments will only come about from a multidisciplinary team of clinicians, software developers, people on the autism spectrum and their families. The app reviews included in this study are anecdotal user testimonials collected from public information. Usage of software for assisting in learning deficits is probably significantly under used. Fascinating look at how apps can help a marginalized group re-connect with the world around them. I still remember the stories of children with autism who brightened up when Pokémon go was released. Made me so happy.